Coney Island, Brooklyn has been a world famous resort for over a century. Located on the southern shore of Brooklyn, it gets its name from the Anglicized version of the Dutch Conyne Eylandt, meaning Rabbit Island. Due to landfill of the Coney Island creek in the 1920s & 30s, Coney Island is now actually a peninsula. Major attractions include the boardwalk, the Brooklyn Cyclone roller coaster, Luna Park, Deno’s Wonder Wheel, Feltman’s of Coney Island, The Thunderbolt roller coaster, The New York Aquarium, Coney Island USA‘s “Sideshows by the Seashore”, Nathan’s Famous Hot Dogs, and The Ford Amphitheater. Top Coney Island bars include Ruby’s, The Freak Bar, Place to Beach and Steeplechase Beer Garden. 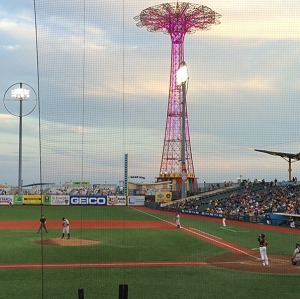 Coney Island is home to the Brooklyn Cyclones minor league baseball team. Annual events include the Coney Island Polar Bear swim, and the Mermaid Parade. Coney Island is accessible via the D​, F​, N​, and Q subway trains. Coney Island franchise of the American bar & grill chain. Tap room of Coney Island Brewery features a rotating selection of 8 house-brewed beers on tap.